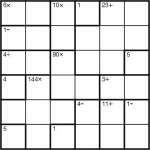 See older Calcudoku posts for the rules, if you need them (click the link in the side bar). This entry was posted by Gareth Moore on November 2, 2009, and is filed under CalcuDoku. Follow any responses to this post through RSS 2.0. You can leave a response or trackback from your own site. Very easy CalcuDoku for me. I did each one in about 2-3 minutes at a guess. I do like that you have dismissed the “subtraction and division can only be 2 boxes” rule that most other puzzles use. I am finding most of the KenKen type puzzles out there are easy at best. The local paper has started including 6×6 KenKen and I usually solve those in 5 minutes or less. I saw a Dell book recently: “EASY KenKen” … Really?! … 1+2=3 … 1*5=5 … can I go play on the swing set now? I think there is potential for this type of puzzle, but I feel as if it is being dumbed down. Thank you Gareth for working at making CalcuDokus interesting. I have recently done a book by Conceptis puzzles called MathDoku. Their 5-star hard puzzles were very interesting … with cages such as 17280x-in-8 and 19+-in-8 (also in funky shapes). I have been pretty shocked by how (as you say) truly EASY the KenKen/CalcuDoku puzzles published elsewhere generally are! Indeed most can be solved without ever having to think about how the possible solutions in different regions combine and interact together – just a straightforward Sudoku-esque solve suffices, with the ability to do maths needed only to narrow down the candidates satisfactorily. I also can’t spot the difference between Dell’s Easy Ken-Ken and their regular Ken-Ken magazine – they are both easy, and I think it is perhaps a marketing test? However that is just a guess! I can make MUCH harder CalcuDoku if you like! Nice to see the puzzles coming again! It sounds from your posts as though you have an awful lot on the horizon at the moment. I also completed these two puzzles very quickly. I really enjoy the Kenken/CalucuDoku puzzles but like Spittledung find most of the published puzzles too easy. I am by no means a puzzle expert (my brain will only take me so far!!) but when I do a puzzle I do like a bit of a challenge and for that reason would not buy the Dell magazines. There’s an invitation to produce a harder CalcuDoku for us!! As regards symmetry, as an enthusiast rather than an expert, it’s not something I really take notice of. Sorry! I had a request for a 7×7 Calcudoku-esque puzzle that uses only + operations, so I thought “why not?”. And here it is. It’s been an age since I’ve posted new puzzles on here directly, mainly because all my puzzle-making effort has been focused on Sudoku Xtra, Sudoku Pro, PuzzleMix and a major book I recently completed. 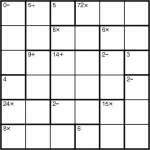 Here’s probably the largest Calcudoku puzzle you’ve ever seen! It’s made up of 8 underlying 9×9 grids, each of which must have 1 to 9 placed into each row and column, and then on top of this I’ve added the familiar Calcudoku regions. Here’s a fun little puzzle – a Calcudoku Inequality puzzle. Here’s a relaxing puzzle for a Sunday… or maybe not! Can you complete this Killer CalcuDoku puzzle made up of 1s, 2s and 3s? There’s a lot of very interesting puzzle space to explore between the extremes of Killer Sudoku and KenKen (a trademark of Nextoy LLC, so I will always refer to this as CalcuDoku from now on, unless anyone suggests a better name! ).